The professional cleaning of Natural Wood Homes is required to maintain the outstanding appearance and exceptional life span that it offers. Clyde Sampsel, the owner of H2O Softwash has extensive experience using the proper techniques and wood cleaning compounds for the professional results you want to see on your home or deck. 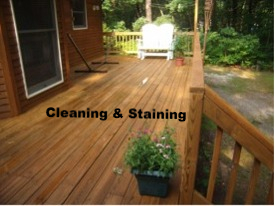 For a small investment in the cleaning of your home or deck you will see beautiful results immediately. When applying stain, it will appear darker for 30 days. If you own a Natural Wood home, you appreciate the unique look and insulating properties that wood offers. 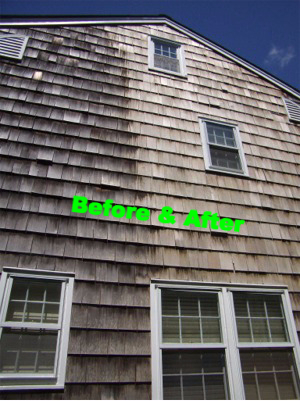 To keep natural wood siding looking its very best, special cleaning and care is required. H2O Softwash can bring back the original beauty of your stained or natural wood siding or log home. It should not come as a surprise that Natural Wood is the second oldest siding material with only stone predating it in the building process. Although it can require more upkeep than vinyl and other siding or man-made materials. Natural Wood is more attractive and a better insulator. There are many different types of wood siding profiles and species used in the Northeast for residential construction. H20 Softwash can help you with Natural Wood Restoration in New Jersey. H2O Softwash has restored many types of wood siding and decking for its clients over the past 20 years, including: Cedar Shingles, Cedar Shakes, Beveled Cedar Siding, Cedar Clapboard Siding, Cedar Shake Siding, Tongue and Grove Cedar Siding, Redwood Siding, Cypress Siding. Split Log Siding made out of Spruce, Pine or Douglas Fir. Natural Log Homes made out of Spruce, Pine, Fir, Plywood Siding (Texture 1-11), to name a few. The words power washing are most often used to describe virtually all forms of exterior house washing. In reality H2O Softwash does not use any pressure when cleaning the soft woods such as cedar and pine that most siding is milled from. Excessive water pressure can quickly do more harm than good to a natural wood sided home. Wood siding, shingles and shakes are easily gouged with high water pressure and the damage is permanent. We have 20 years worth of experience in the Northeast cleaning, staining and painting Natural Wood homes with precision and earth friendly chemicals. H20 Softwash can restore wood decks and homes by stripping off all previous coatings of paint and stain so that we can treat the wood deck or home so that the wood is preserved for many years! Western Red Cedar Siding – cleaning of cedar shingles and cedar shakes is a soft wash process that varies depending on the condition, age and finish of the siding. Cedar is extremely soft and easily damaged with water pressure.H20 Softwash can clean, seal or stain your cedar home to look like new again. White, Red and Yellow Pine Siding – the cleaning of pine siding is very similar to cedar. The major difference is that pine usually receives a high quality exterior paint finish while cedar is naturally weather resistant and can be left natural. Spruce Siding – spruce cleaning almost always involves a mild green cleaning solution that won’t remove the paint or stain. If a complete refinish is required the old finish will have to be removed with an alternative chemical cleaning process. Douglas Fir Siding – fir is more durable then spruce or pine and is often used for natural logo homes. The H2O Softwash process clean is able to clean Douglas Fir siding to a like new condition. Cypress Siding – more durable then Pine, Spruce or Fir and becoming more commonly used in New Jersey when natural wood is selected. Soft washing with wood cleaning compounds is the best cleaning method for cypress siding. Redwood Siding – very similar properties to cedar. Naturally insect resistant and weathers very well without preservatives or paint. The soft wash process is required due to the softness of the wood. Ocean and Monmouth Counties in New Jersey have many neighborhoods and areas clustered with natural wood sided homes. Bay Head, Millstone Township and Long Beach Island are a few of the areas that H2O Softwash has serviced recently for Natural Wood Homes. The cleaning of wood siding is not as simple and straight forward as some exterior cleaning contractors would lead you to believe. There are a few variables that will determine the out come of each cleaning job. Many professional products on the market used for cleaning wood siding. The first thing that needs to be done is the identification of the mildew, algae, dirt or stains that need to be removed from your natural wood siding. This is where H2O Softwash separates itself from the competition. 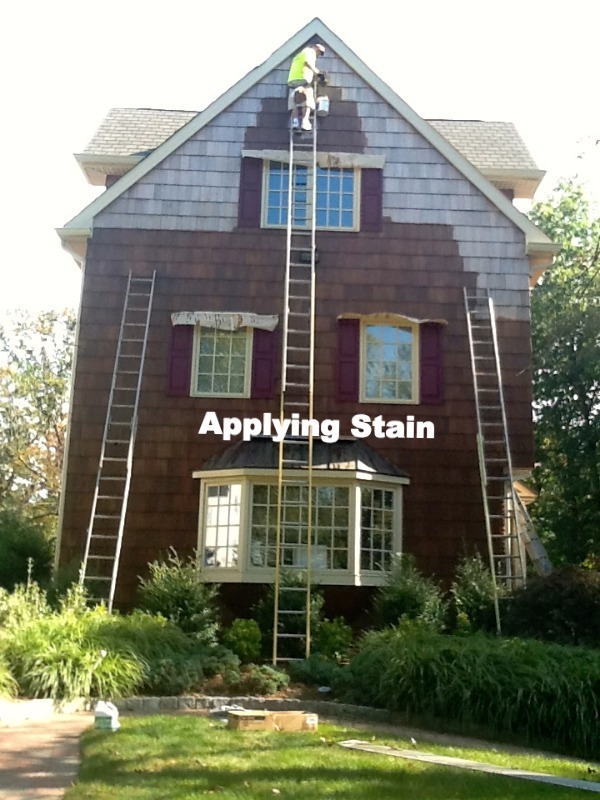 Clyde Sampsel will select the correct cleaning compound to remove the organic growth, dirt or stains from your siding. H2O Softwash has been cleaning natural wood homes for 20 years. They know when to use the soft wash process to safely clean cedar, pine, cypress and other type of wood siding. Deck Cleaning and Staining – for a new deck we can stain or apply a transparent stain that not only look good but will preserve the wood. For properly preserved deck only a light cleaning and a light coat of stain to freshen up the deck in the future. Painted decks – we can strip all the previous coatings off and the end result is it looks like new and ready to accept a transparent stain or colored stain that looks good and really preserves the wood. H2O Softwash provides professional cleaning services for owners of log homes and natural wood siding homes. Please complete the Contact / Estimate Form or call / txt us today at (609) 971-6553 to receive a FAST FREE ESTIMATE.